The world’s leading scientist’s hometown does well to showcase the life and works of Albert Einstein. 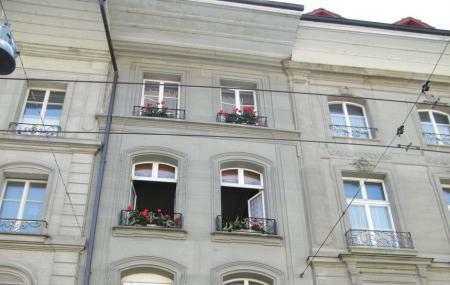 The small apartment here in the Al Stadt, was where Albert Einstein lived with his family from 1903-1905. Although he only sought residence here for a couple of years, it was within the walls of this house where he came up with the theory of relativity! The museum, small as it may be, is quite significant and imparts with a lot of knowledge to its visitors. A 20 minute biographical film tells you all you need to know about Einstein’s life. People normally club together Bear Park and Bern Historical Museum while planning their visit to Einsteinhaus. Einsteinhaus has a coffeehouse at the basement, which is quite busy. The manager of our hotel told us that this place serves the best coffee in Basel. Well, the coffee was good, but can't judge whether it was the best in Town! When we went the Einsteinhaus museum was closed. The surrounding area had quite a festive feel (we went right before Christmas). They don't accept credit cards. It's a pretty minimalist museum. If you have watched the first season of Genius, you'll know everything about him that's on the walls. It's cool to stand in the place him and his wife came up with so many cool ideas. It's quick. Small but lovely museum in the home Einstein lived in during his time in Bern. It won't take you too long to get through it, but it's cheap and worth 30-45 minutes of your day. Kinda' cool to say you've visited Einstein's old apartment. Really informative and worth the visit. Close by are some stellar pastry shops.